While visiting Cobh there are several key attractions to experience. For the keen historian, Titanic Experience Cobh offers a partially guided, virtual tour giving an insight into the final 123 passengers on the famous liners’ final journey. This tour includes holograms, audio-visual presentations and exhibits and lasts an hour. 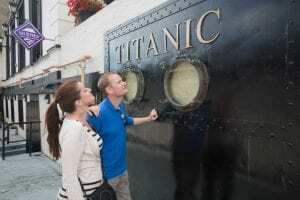 The Titanic Experience is located in the original White Star Line Ticket Office on Casement Square in heart of Cobh town, approximately 20 minutes’ drive from Clayton Hotel Silver Springs. Free parking is available at Cobh Cathedral and Cobh Heritage Centre car parks, both 1km stroll from the town centre. Take the ferry to Spike Island out in Cork Harbour to see the fortress and ‘Ireland’s Alcatraz’. Enter the original White Star Line Ticket Office and learn about life about the ship and the story of the 123 passengers who joined at Cobh.